President Muhammadu Buhari Friday inspected Eko Atlantic City built on 750 square kilometres. The city is adjacent to Victoria Island and designed to solve the acute shortage of real estate in Lagos State. Buhari inspected the city, which was conceived to save Victoria Island from ocean surge, alongside the National Leader of All Progressives Congress, Asiwaju Bola Ahmed Tinubu, Lagos State Governor, Mr. Akinwunmi Ambode, among others. 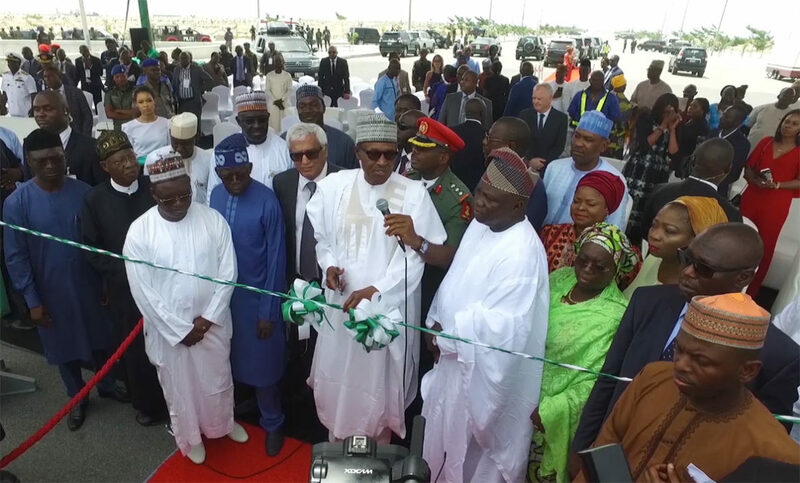 After inspecting the emerging coastal city for about two hours, Buhari said he was extremely impressed with the project, which he said, was capable of transforming the Nigerian economy. The president said he was equally impressed with the number of jobs the project would generate and the effect the development of the Eko Atlantic City would have on the nation’s economy. â€œI am extremely grateful to those that agreed to invest so much in our country. I am really grateful to those who accepted to invest in our country with the aim to get a secured area. The Eko Atlantic City is good for operations. â€œThe city is capable of handling big business and investment throughout Africa. I am truly impressed with what it is capable of bringing,â€ the president, who is on a two-day visit to Lagos, said.